Each week, we all work on various fibre-related things that we are excited to share with one another. Some share on Instagram (use #fiberfriday – note the American spelling to keep things simple on Instagram!) but some of us still blog about our fibre-y pursuits. 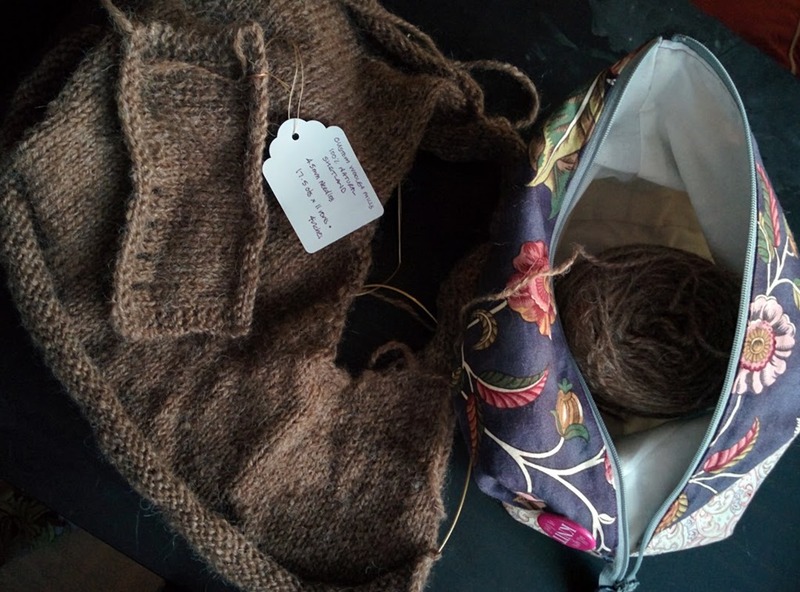 If you’d like to join in, blog and post a photo of your fibre pursuits, link up and share with the rest of the community what you’ve been working on! It’s a great way to stay motivated, inspired and surrounded by a community of fellow handspinners, knitters and crafters in general! Please keep it fibre-related, friends. This week was all about starting new things. I have a serious case of cast-on-itis. I want to start all the things and am barely keeping myself at bay! In the end, I allowed myself to start a new knitting project mostly because I really didn’t want to start a new spinning project with so many in-progress already. I need to finish my Dad’s birthday socks but the weather is warming up and I find my motivation for warm, woolly socks diminishes with better weather. I ended up pulling out my recently finished Shetland and wound it all up. Using my yardage counter, I learned that I have 834 yards of DK, which is perfect for the pattern and my gauge was spot on with the pattern. One small snafu is that I want to make the vest longer and larger through the hips. The pattern for my size calls for 800 yards of yarn, including the two colour brioche colour (I wasn’t planning a contrast colour for the brioche but instead just a regular brioche stitch pattern). This may end in my needing to spin some more yarn and in fact knit a two colour brioche shawl collar after-all. I’ll see how I’m doing yardage-wise when I cast off the body! Feel free to grab the button below and share it on your own blog! Below is the link up list of everyone participating – I hope you’ll join us! Be sure that the link you submit is to the URL of your blog post, not your main blog or a previous FibreFriday post (for future). Include a link back to this post so that others can find it easily and join in! Any troubles, just email me and I’ll be happy to help :: rachel [at] welfordpurls [dot] com. I have been trying to have some startitis, however there has been more frogging than starting here! However, I have had some spinning successes and I will take that every day! What vest pattern are you using? The Jacob I’m spinning up for ZerotoHero might want to be a vest too. But I have a long way to go before I know what kind of yardage I’ll end up with. I impulsively cast on a new shawl even though it was not supposed to be started for awhile. I just needed the bright colours (blue and orange) after all the natural colours I’ve been spinning. And the soft, squishy garter stitch is comforting but I still have wips that I really need to get done ..
It’s the Pommier vest – I linked to it in the post, I think?! I know what you mean about the bright colours after all the natural shades. I love them but sometimes I want colour too! !